This article is about the Donkey Kong 64 enemy. For a list of books based on the Mario franchise, see List of publications. For the item from Mario's Time Machine, see Book (item). For the book in Mario & Luigi: Paper Jam containing the paper world, see Paper Mario book. 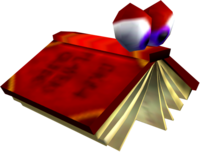 Books are large, red library books that only appear in a library passage within Creepy Castle in Donkey Kong 64. A Golden Banana appears at the end of the passageway, which can only be accessed by Donkey Kong, but several Books are blocking the path to it. The Books endlessly and rapidly flap between two adjacent bookcases. Donkey Kong can only safely pass through the Books by using his Strong Kong ability. Books cannot be defeated and they vanish if they hit into Donkey Kong, who is injured by the attack unless his Strong Kong ability is active. If Donkey Kong stands in the path of a Book, it does not fly through him and instead glares at him then vanishes. Books bear a strong resemblance to Cheato from the Banjo-Kazooie series. Furthermore, their Japanese name is the same as that of Cheato's. The book title on a Book's front cover reads DK64 Players Guide, a reference to Donkey Kong 64's corresponding Nintendo Power guide. The title is too faint to read within the game itself. The attack patterns of Books is similar to that of Bookends in the library room of Big Boo's Haunt in Super Mario 64. ↑ Donkey Kong 64 Banana Guide on Nintendo.com, Nintendo. Retrieved April 16, 2015. This page was last edited on April 7, 2019, at 21:36.